Dewey & LeBoeuf filed for Chapter 11 protection on May 28 and as of Wednesday, 12 law firms, financial and restructuring firms filed fee and expense requests in bankruptcy court. Those fees span the time period from May 28 through the end of October, according to The Am Law Daily. The fee request was submitted by Dewey bankruptcy counsel Togut, Segal & Segal and is worth $4.7 million. It is the largest request so far, with the $3.6 million fee being submitted by chief restructuring officer Joff Mitchells’ firm. Mitchell’s firm is Zolfo Cooper. According to the court filings, Al Togut, a named partner for Togut, Segal & Segal, has billed 943 hours at $935 per hour for work related to Dewey. Togut’s partner, Scott Ratner, has billed 1,218 hours at a rate of $800 per hour. Litigation by the firm cost $1.4 million, partner settlement discussions cost $674,083 and photocopies cost $21,843. Other bills submitted include meals and car services used to and from the office. The counsel for an official committee of unsecured creditors, Brown Rudnick, has filed a fee request of $2 million. Rudnick said that the majority of the fee request comes from communications with creditors and meetings. 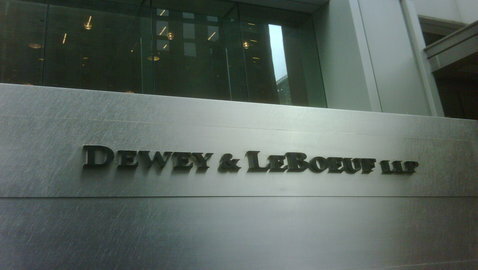 Kasowitz, Benson, Torres & Friedman, the counsel for Dewey’s former partners, has filed a fee request of $1.3 million. The committee of former partners is comprised of partners from the two legacy firms of Dewey, Dewey Ballantine and LeBoeuf, Lamb, Greene & MacRae. A fee request of $1.2 million was filed by financial consultants from Goldin Associates, who were involved in the creation of the partner contribution plan at Dewey. Fee requests were also filed by Sitrick and Company and Development Specialists Inc. Sitrick and Company filed a fee request of $248,860 and Development Specialists Inc. filed a fee request of $57,258. Ernst & Young filed a fee request of $60,235 for working as tax counsel to Dewey during the Chapter 11 filing process. Keightley & Ashner, a pension legal adviser, filed a fee request of $158,591. Epiq Bankruptcy Solutions, a bankruptcy administrator, filed a fee request of $69,531. Deloitte Financial Advisory Services filed a fee request of $653,415 for its work as financial adviser to unsecured creditors of Dewey. Thierhoff Muller & Partner, a firm from Germany specializing in restructuring, has filed a fee request of €249,910, which is close to $330,000. This would be paid from the secondary insolvency overseas. Most of the requests will be weighed in on by a judge on January 24. A handful of the requests have been paid out already on a partial basis.